A new Monopoly token has been introduced into the long-time family favorite board game. Hasbro has finally implemented plans to drop the iron, and say hello kitty, following a competition vote by the public earlier this year. 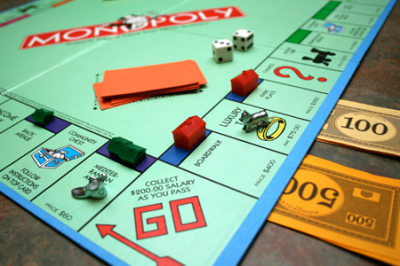 The contest held by Hasbro a number of months back saw Monopoly fans vote on which token they wanted dropped from the game, and what new design to implement as a replacement. Following the vote it was found that the iron was to be kicked to the curb, and a new cat would be introduced. According to reports this week, Hasbro has already started shipping Monopoly games with the new cat token. Eric Nyman, senior vice president and global brand leader for Hasbro Gaming, said: "We know that cat lovers around the world will be happy to welcome the new cat token into the Monopoly game." Speaking fondly about the passing of the iron, which was an original token that debuted more than 75 years ago, Nyman said, "While we're a bit sad to see the iron go, the cat token is a fantastic choice by the fans and we have no doubt it will become just as iconic as the original tokens." Of course Hasbro has retired tokens in the past, including a lantern, a purse, a rocking horse, a cannon and a sack of money. However, the iron's departure remains a controversial one, and has upset some fans who believe the iron was too much of an iconic piece to suddenly drop.